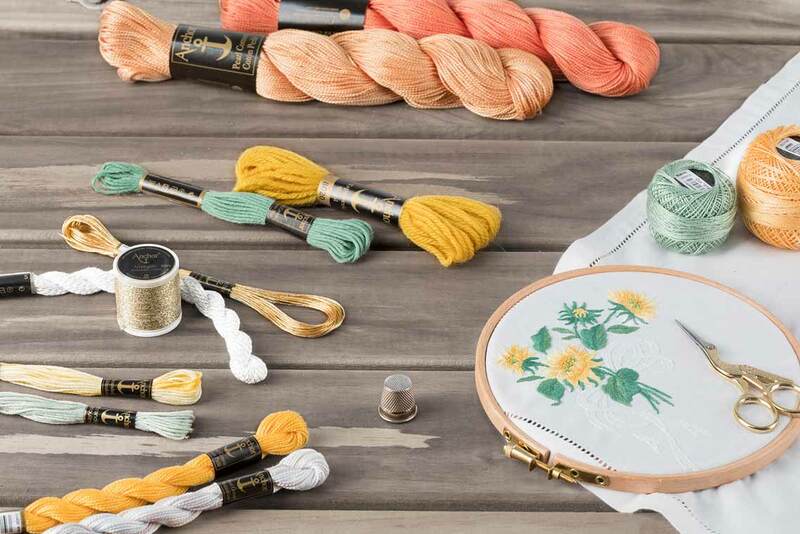 Anchor embroidery high quality threads are known for their wonderful choice of colours and endless design inspiration suitable for all skill levels. Ideal to enjoy and relax with any hand embroidery project. A strandable (12) metallic embroidery thread made of Viscose and Metallised Polyester for a metallic effect. A soft and thick, extra-long staple 100% Egyptian Giza cotton thread with a matt finish. A single ply chain construction embroidery thread made with Metallised Polyester and Polyamide for a shinning effect. An extra long staple 100% Egyptian cotton thread, mercerised and lustrous tightly twisted in 4 Ply. A 6 strands extra-long staple 100% Egyptian cotton double mercerised thread that provides a brilliant lustre, unique softness and intense light reflection. 100% Pure New Wool thread with a uniform tight twist (4 ply) construction which provides an even work and minimises fraying. 100% Egyptian Cotton mercerised thread with a 2 and 3 ply structure, ideal for lacework. 100% Viscose and loosely twisted (4ply) embroidery thread with a spectacular high sheen.